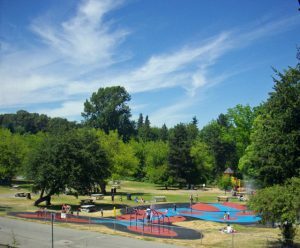 Hume Park is a beautiful location that has truly given our unique distributed learning program a home. So, what is the Hume Park Home Learners program? We started with a little group of fifteen students ranging from kindergarten to grade 7. We moved locations six times in our first year and a half, and most of our resources were borrowed, donated and hand me downs. We were actually dubbed the ‘Homeless Learners’ until we established a long-term location in uptown New Westminster. There were many hurdles in the development of a program, however, the Home Learners Program did manage to move ahead, and has become a creative way to teach and learn. Three years ago, we moved to our current location nestled in the beautiful Hume Park, and our name evolved to Hume Park Home Learners. We are a distributed learning program, meaning that we share learning with the family. The education of each child is a joint venture, a partnership between teachers, parents and children. Sometimes this also involves grandparents, caregivers, tutors and community programs. Our program is somewhat unique in the fact that we celebrate both individualized learning, and a rich community of learners. Our program is not just kids learning at home in a secluded setting, nor is it a curriculum in a box, or, a one sized fits all computer delivered program. Our philosophy starts with getting to know about each child, how they learn, what their strengths and interests are, and then to develop an individualized program to set and achieve both learning goals, and social-emotional goals. It allows us to work with the whole child, and set a pace and style that will support that child in their learning journey, and to support an entire family for many years. This is the individualized part of Hume Park Home Learners. It allows for a wide range of resources being used, and the development of projects and portfolios as a means of demonstrating and sharing a child’s learning. We use face-to-face conferences to celebrate achievements and set next steps in learning. I have been fortunate in my life to have found and created work that supports my life, and that is truly what I love to do. This is something that I have been able to pass on to my children. They are the product of a family that chose passion over money, and of an education that allowed them to develop their ideas and skills at a young age. They were able to include all their passions in their learning journey, and today, each of them has a career of their choosing, and which they started in their teens. They may not be rich, but they are happy. They also know they can learn anything they need when they want to change paths. My oldest son, Kiefer, who recently moved into his own apartment, says often, “ I’m so glad you raised me the way you did. I’m good at my job because you taught me to think outside the box.” The teachers at Home Learners often comment how they love their jobs. We have each had our own children in the program, so we truly believe in what we are doing. We are able to follow the curiosity of a child, and capitalize on that curiosity. We can recognize areas that a group of children need to develop, and that can be academic or social, and use that as a springboard for all other learning. We have flexibility in what and how we teach, since we try to tailor that with the needs of our community, and because we work in partnership with a family. This allows us, as teachers, to focus on the big ideas, and have parents focus on the smaller details at home. Family Camp: A 3-day adventure for the whole family! Our Music Program is growing!